A century and a half ago on the July 7th , 1865 — one of the last grim scenes in the tragedy of the Civil War was played out — and caught on camera — at what is now Fort McNair, in Southwest Washington. Mary E. Surratt — the first woman to be executed by the federal government — Lewis Powell, George Atzerodt and David Herold had been convicted by a military tribunal of conspiring with John Wilkes Booth in the murder of Lincoln. Booth had been killed 10 weeks earlier while trying to escape, after shooting Lincoln in Ford’s Theatre on April 14. All the condemned were local Southern sympathizers implicated in the plans, first to kidnap Lincoln and later to kill him, Vice President Andrew Johnson and Secretary of State William Seward. Secretary of State William Seward. Seward survived a brutal knife attack by Powell the night Lincoln was shot. Johnson escaped harm when Atzerodt lost his nerve and failed to execute his part of the operation. Herold had helped Booth escape and was “the getaway guy,” as one expert put it. And by most accounts, Surratt knew of the plot and abetted the plotters from her boarding house on H Street NW. The four were lined up — their arms handcuffed, their feet shackled — as an officer read the execution order and the photographer, Alexander Gardner, aimed two cameras from about 100 feet away. Mary Surratt — Surratt owned a boarding house in Washington where the conspirators met. Sentenced to death, she was hanged, becoming the first woman executed by the United States federal government. 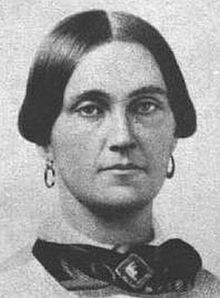 Mary Elizabeth Jenkins Surratt (1820 or May 1823 – July 7, 1865) was an American boarding house owner who was convicted of taking part in the conspiracy to assassinate U.S. President Abraham Lincoln. Sentenced to death, she was hanged and became the first woman executed by the US federal government. She maintained her innocence until her death, and the case against her was and is controversial. Surratt was the mother of John H. Surratt, Jr., who was later tried but was not convicted of involvement in the assassination. Adjusting the ropes for hanging the conspirators. David Herold — An impressionable and dull-witted pharmacy clerk, Herold accompanied Booth to the home of Dr. Samuel Mudd, who set Booth’s injured leg. The two men then continued their escape through Maryland and into Virginia, and Herold remained with Booth until the authorities cornered them in a barn. Herold surrendered but Booth was shot and died a few hours later. White cloth was used to bind their arms to their sides, and their ankles and thighs together. Lewis Powell — Powell was a former Confederate prisoner of war. Tall and strong, he was recruited to provide the muscle for the kidnapping plot. When that plan failed, Booth assigned Powell to kill Secretary of State William Seward. He entered the Seward home and severely injured Seward, Seward’s son, and a bodyguard. Lewis Thornton Powell (April 22, 1844 – July 7, 1865), also known as Lewis Payne and Lewis Paine, was an American citizen who attempted to assassinate United States Secretary of State William H. Seward on April 14, 1865. He was a conspirator with John Wilkes Booth, who assassinated President Abraham Lincoln the same night. Powell was a Confederate soldier wounded at Gettysburg. He later served in Mosby’s Rangers before working with the Confederate Secret Service in Maryland. He met Booth and was recruited into an unsuccessful plot to kidnap Lincoln. On April 14, 1865, Booth resolved to assassinate Lincoln, Seward, and Vice President Andrew Johnson. Powell was given the task of killing Seward. He was assisted by David Herold, who guided Powell to Seward’s home and kept horses ready for the escape. Powell severely injured Seward, and Herold fled before Powell could exit the Seward home. Powell lost his way in the city, and three days later arrived at a boarding house run by Mary Surratt, mother of co-conspirator John Surratt. By chance, the police were searching the house at that moment, and arrested Powell. Powell and three others, including Mary Surratt, were sentenced to death by a military tribunal and were executed at the Washington Arsenal. Close-up: The death warrant for the four is being read aloud by General John F. Hartranft. George Azterodt — German-born Azterodt was a carriage painter and boatman who had secretly ferried Confederate spies across Southern Maryland waterways during the war. 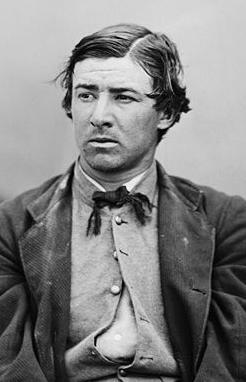 Recruited by Booth into the conspiracy, he was assigned to kill Vice President Andrew Johnson, but lost his nerve and stayed in a hotel bar, drinking, instead. George Andrew Atzerodt (June 12, 1835 – July 7, 1865) was a conspirator, with John Wilkes Booth, in the assassination of U.S. President Abraham Lincoln. Assigned to assassinate U.S. Vice President Andrew Johnson, he lost his nerve and did not make an attempt. He was executed along with three other conspirators by hanging. Close-up: A white bag was placed over the head of each prisoner after the noose was put in place. The conspirators stood on the drop for about 10 seconds, and then Captain Rath clapped his hands. Four soldiers knocked out the supports holding the drops in place, and the condemned fell. Close-up: The bodies continued to hang and swing for another 25 minutes before they were cut down. After last rites and shortly after 1:30 PM, the trap door was opened and all four fell. It was reported that Atzerodt yelled at this very last moment: “May we meet in another world”. Within minutes, they were all dead. The bodies continued to hang and swing for another 25 minutes before they were cut down.